Hi, my name is Lee Hardy, Grand Master Dog Behaviour Therapist for Bark Busters Home Dog Training Burton on Trent. I've been working as a Bark Busters dog behaviour therapist for over 19 years and I am now one of the longest serving trainers. I have successfully helped over 3,500 dog owners and their dogs overcome their behaviour problems. It all started when my life was completely changed by my dog. We all love our dogs, but Rannan, a beautiful black Labrador, was a real handful in the early years. She had a multitude of behaviour problems, the worse of which was serious aggression to other dogs. After struggling on my own, I seriously considered my options, but not one to give up, I sought some professional help. I contacted Bark Busters for help and during the very first visit from the local therapist I began to understand life from Rannan’s point of view and was able to calmly show her that I could make decisions on her behalf to keep her safe. I understood that she was extremely anxious about interactions with other dogs, so she was being defensive in the only way she knew. Very soon, she began to relax and with consistent communication, she spent many happy years living with me and what went on to be my other six dogs! The Bark Busters techniques I learned helped me with my family pack and I began to think that helping others to achieve what I had, would be a great way of life! I made the decision to join Bark Busters and have happily spent the subsequent 19 years enjoying my days providing help and support to thousands of dog owners and their dogs. Life is understandably varied. From working with different rescue centres, including the RSPCA in Burton on Trent, helping new adopters and especially working with those dogs deemed difficult to rehome. The video, here on my profile page, tells the story of Dino, a rescue dog that was too difficult to rehome, until I worked with him to find his forever home. One memorable occasion for me was with a family with 12 (yes 12) dogs! 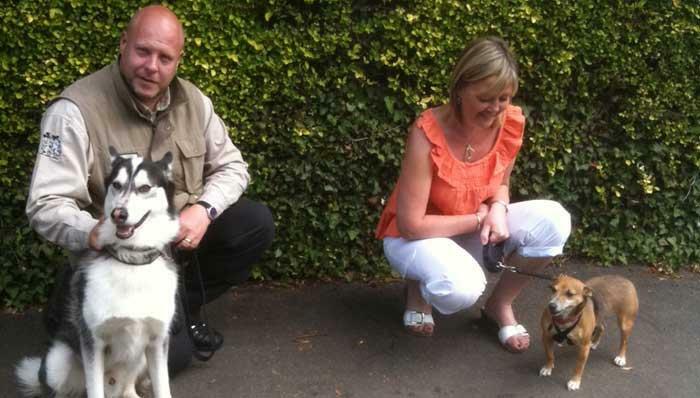 That was a great experience, helping them to walk their dogs on lead without being treated like a sled being dragged. It was certainly an achievement for the owners, using the calm, kind and effective communication techniques I had learned and taught the owners. Dogs see the world in a very different way to us humans, so it’s understandable that we sometimes find that the dog we hoped would be a great addition to the family, has become unruly, noisy, destructive or seemingly unpredictable in some way. It sometimes seems that a dog is defiant and trying to punish us; they are just seeing the world in a canine way, so it’s important for us humans to learn their language. That’s where Bark Busters can help! My work is very rewarding; using fun training techniques and seeing dog owners rebuild relationships with their dogs, their dogs changing in front of their eyes, into focused happy to respond members of the family. It’s great working with experienced dog owners to people bringing home a new puppy for the very first time to join the family and showing them how to ensure their puppy has the very best start in life. Our training programme is based on the way that dogs communicate with each other, it’s simple and easy to follow and in most cases, you will see a difference in the way your dog responds to you in the very first lesson. Do check my testimonials for confirmation of what dog owners are saying about me! 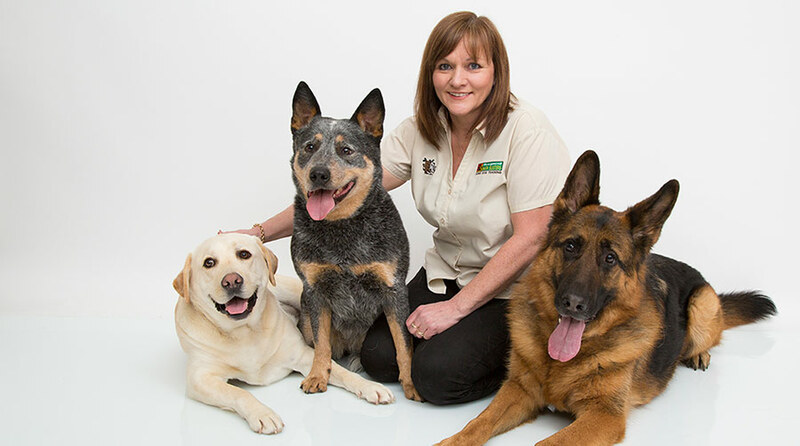 I can help you with behaviour problems such as boisterousness, excessive barking, separation anxiety, aggression, toilet accidents, resource guarding, pulling on the lead, separation anxiety, destruction or lack of recall and much more. Maybe you're looking for puppy training and would like to make sure your puppy has a good educational start in life then I can tailor a programme to suit you. Please do drop me a line to find out how I can help.